What are the Latest Home Theater Seating Trends? When the term “home theater” seating is mentioned, the first thought that generally comes to mind is the image of a row of recliners with tall back rests. This has been a standard for many years and will continue to be the “go to” in most dedicated home theater environments. However, over the past several years there has been an evolution taking place as the consumer is realizing that the entertainment room has become a space with multiple capabilities and disciplines. The interior design community has been integral in providing a different perspective to the dedicated entertainment space, perhaps unknowingly. As time goes on and the entertainment room is being used for more than just a movie viewing area, the furnishings and layouts have become more diversified to accommodate a more casual and interactive environment. That being said, the following are some of the considerations to keep in mind when you consider the appropriate seating product to use in your personal entertainment environment. In addition, we will touch on some key elements that are important to factor into your seating decisions. Seating styles have become more abundant with the demand for more informal spaces. Traditional theater seats, club chairs, lounge seating, customized modular sofas, chaises and casual bar type stools are often used in different configurations. This provides a more integrated environment that can be formal, casual or create a party type atmosphere while enjoying big screen entertainment. Although the seating aesthetic is usually a prime concern as the cosmetics of the space is very important, comfort is an equally key component of the experience. Everyone has experienced commercial movie theater seating and realize that these seats were built for quantity, not quality. A well-built entertainment seat is constructed to provide a comfortable experience where you can sit for several hours and not feel fatigued when the final credits roll! Technology has become an important element of the entertainment seating experience. Everyone is familiar with the concept of the recliner. In most cases the recliner is an “over-stuffed” armchair that has an adjustable back and footrest. There are other factors that comprise a truly comfortable seating experience. Having the ability to create your own personal comfort by having independently adjustable back rests, foot rests and even an articulating headrest provides are highly desirable features. Being able to control the temperature of your seat and adjust the lower back support creates the same, if not better, experience you will find in high-end luxury automobiles. These enhanced features may be found not only in the traditional recliner, but in custom modular sofas and other seating types as well. The new generation of quality entertainment seats offer technology like retractable tables in the arm rests similar to those found in aircraft seating, low-voltage charging ports for your smart phone and tablet devices, integrated low voltage reading lamps, seating position control buttons with memory, cup holders that keep your drinks cool, or warm, home automation system control of the entire seating configuration, and many other convenience-based features and options. The manufacturers of quality home theater and media room seating can make seating the way you want it with customization of size, fabrics, leather options, and fine wood veneers. VIA is well positioned to work with you and your interior design team to provide the ultimate in seating options exactly the way you want them. Contact VIA to create a truly beautiful, comfortable and technology-savvy seating environment for your home theater or multi-purpose media room. This article was generously donated by Andy Willcox, VP of Sales for CINEAK Luxury Entertainment seating, Americas and Asia Pacific regions. 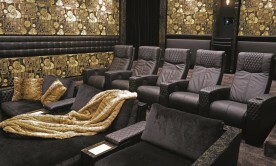 Read more about CINEAK seating by clicking here.